Tappan Middle School science teacher Susan Baker has some company in her staff photo I.D. Cradled in her hand is Ms. Hammer, a three-toed Eastern box turtle who long ago became the classroom pet. 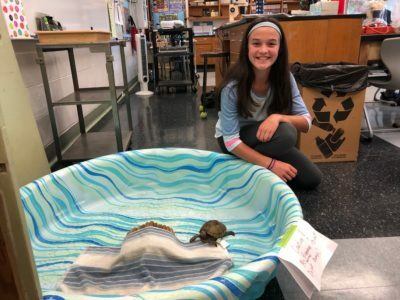 For 27 years, Tappan students have gotten to know—and in many cases, care for—the brown-eyed, inquisitive reptile. In the fall of 1991, one of Sue Baker’s life science students found the turtle in the neighborhood near Tappan. The student said Baker could keep her as long as he could name her after his favorite musician, MC Hammer. 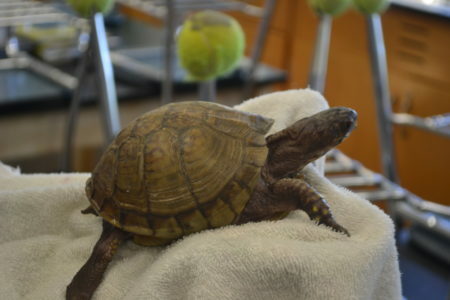 Hammer’s shell was cracked and the turtle was bleeding, so Baker took it to the Animal Kingdom Veterinary Clinic. Soon the turtle was on the mend, and on her follow-up visit, the vet explained that because her eyes were brown and not red, Hammer was female. 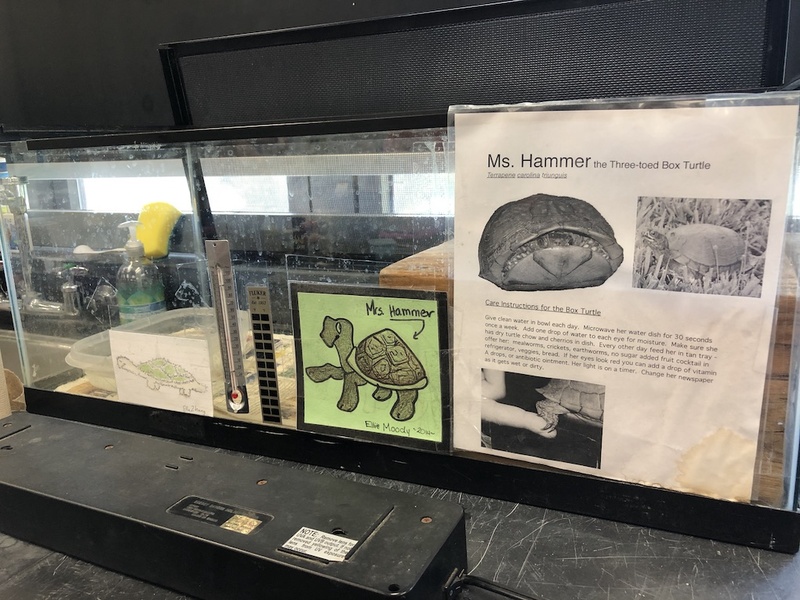 So Hammer became Ms. Hammer and quickly took up residence in Baker’s classroom aquarium. One of those kids became a science teacher himself. Matt Gittleson told Baker that her class inspired him to enter the field. When he came to her classroom to talk to the students, he was pleasantly surprised to discover Ms. Hammer—whom he had helped care for—is still alive and well, and that Baker still had a photo of the two of them together. 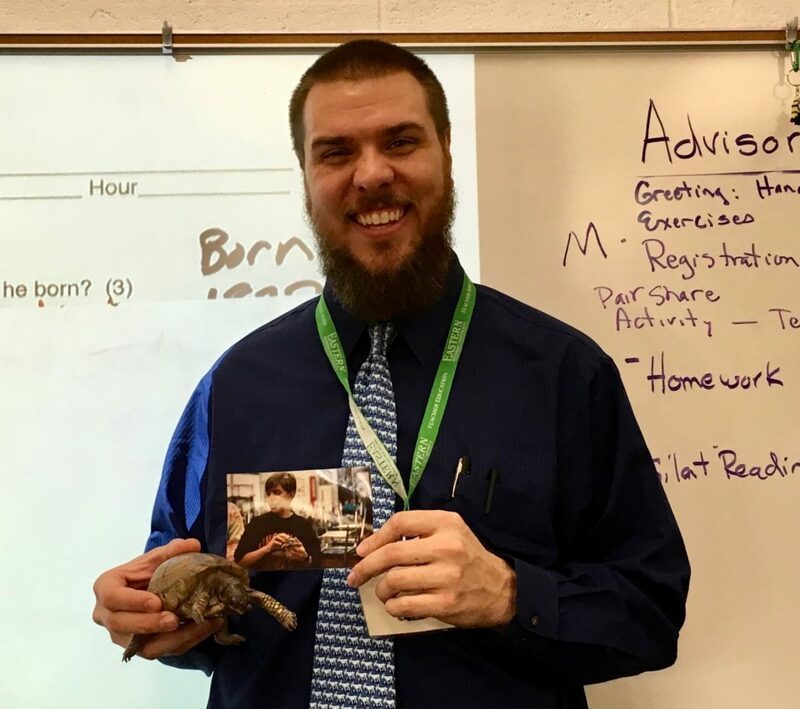 On a visit to Sue Baker’s science class, former student Matt Gittleson holds a picture of himself holding Ms. Hammer back when he was a Tappan student. Ms. Hammer still has lots of friends at school. In fact, several students come in at lunchtime to feed her and place calendula cream or coconut oil on her skin when its dry. They also create tasty smorgasbords for Ms. Hammer using tidbits from their own lunches. Ms. Hammer is usually happy to stay in her aquarium. When she wants out, she’ll flip her water dish. That’s her way of asking to be placed into the plastic wading pool filled with objects she can climb on, over, and around. On weekends and vacations, Ms. Hammer is tucked into a cat carrier for the drive to Baker’s small Chelsea area farm where she shares the space with a horse, two goats, and a cat. Ms. Hammer is estimated to be at least 37 years old, with a life expectancy of 65. She needn’t worry about being alone in her later years. Baker’s trust makes it clear that if something happens to her, Ms. Hammer will go to the Creature Conservancy where an employee there has agreed to take care of her. In the meantime, Baker hopes many more Tappan students will get the chance to learn about reptiles from Ms. Hammer.